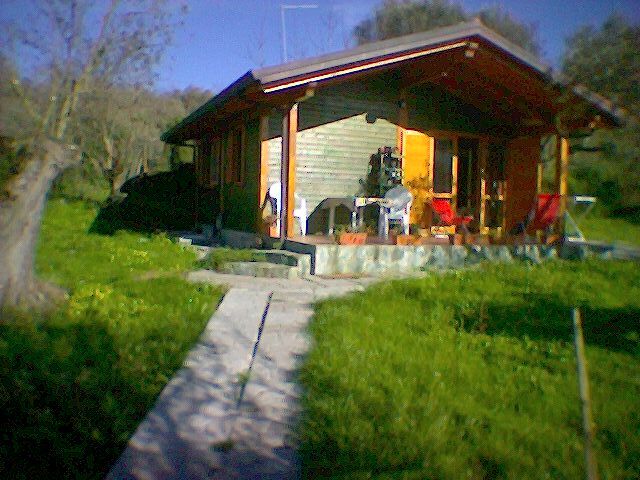 Nice woodden chalet on Tropea hills, 90 km from Sicily. View of Eolian Islands with Stromboli Volcano. We use to give our guests local products as red wine, red onions from Tropea, fresh eggs, fruits and vegetables that we produce. We provide our guests also umbrella and towels for the beach. Bicicles aivables to get around. We organize also Trekking tours. There is Satellite-TV, CD and DVD player with many movies, refrigerator, a kitchen, 4 beds in separate rooms, a bathroom (with lavabo, bidet and shower) a big veranda with barbecue, private parking. The place is very quiet and there is a little wood at 200 metres. At 700 m there is a little village with bars, shops and restaurants. There is a big square and a public garden where families with children enjoy to spend their summer evenings. 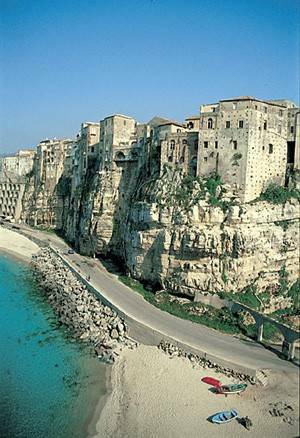 Tropea is one of the most beautiful towns in Calabria comes into view in the south of the Tyrrhenian coast. Austere and majestic, Tropea rises out of the promontory of Monte Poro which lies between the two gulfs of Sant'Eufemia and Gioa. Tropea overlooks a mirror of sky-blue, crystal-clear sea, with its incredible rocks: La Pizzuta, Formicoli, San Leonardo and Isola Bella, the Tropea symbol. The Tropea wild, white, sandy beaches which snake their way into little grottoes and creeks are interrupted by valleys and fertile, rippling hills full of fruit and citrus fruit trees, onion and vegetable fields, bougainvillaea, verbenas, lime trees, jasmine and other sweet-smelling Mediterranean plants. In Tropea apart from the limpid, unpolluted sea, Tropea itself offers a fascinating historical and artistic profile, thanks to its patrician houses with their impressive entrances adorned by capitals with frescoes by important artists and to the numerous, ancient churches rich in sacred images recalling singular legends. opea, wonderful calabrian country in province of Vibo Valentia, undisputed pearl of the tourism of the Region, is situated between Nicotera and Pizzo Calabro, the two countries who delimit the 'Costa degli Dei' or the 'Costa Bella'. The two attributes are to indicate the wonders that this part of the coast is able to offer to his visitors. The two attributes are to indicate the wonders that this part of the coast is able to offer to his visitors. 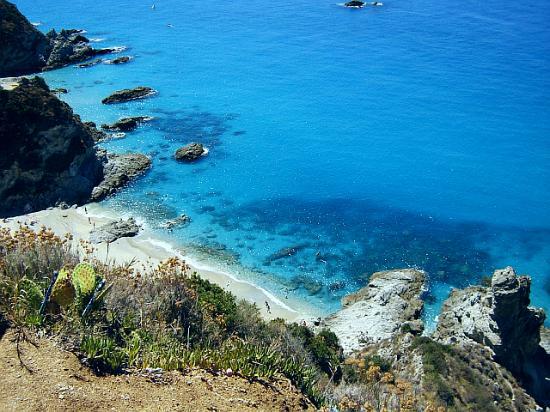 Joppolo, Coccorino, Ricadi, Capo Vaticano, Zambrone, Parghelia and Vibo Marina are the other beautiful places of the coast. We want to introduce you to the beauty of calabrian countries and moreover, we want to propose you other wonderful places where art, culture, cooking and story are the ideal frame to the wonderful sea of the 'Costa degli Dei'. 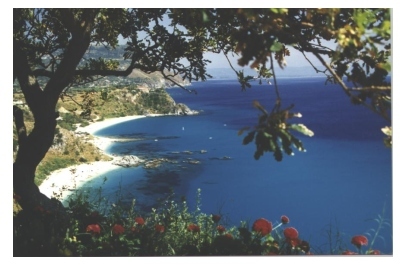 Therefore Tropea becomes the synonym of vacation on all the coast, the 'Costa degli Dei' the ideal goal for tourism between relax, history, culture and good cooking. The coast is not only sea, but there are many importants Museums and artistic places to testimony how this region was land of art and culture. Here there are few public means of transportation. We suggest you to arrive with a car renting it at Lamezia Terme Airport or Tropea Train Station.